Manchester City will struggle to avoid being banned from Europe by Uefa from 2013 onwards because of £250m already spent on transfers that still needs to be “processed” in their accounts in the next five years. Uefa has confirmed that City will not able to accelerate the “writing off” of this massive sum in next year’s accounts to improve their chances of meeting the incoming Financial Fair Play regulations. The club acknowledges privately that “a huge challenge” lies ahead to meet Uefa’s break-even targets. 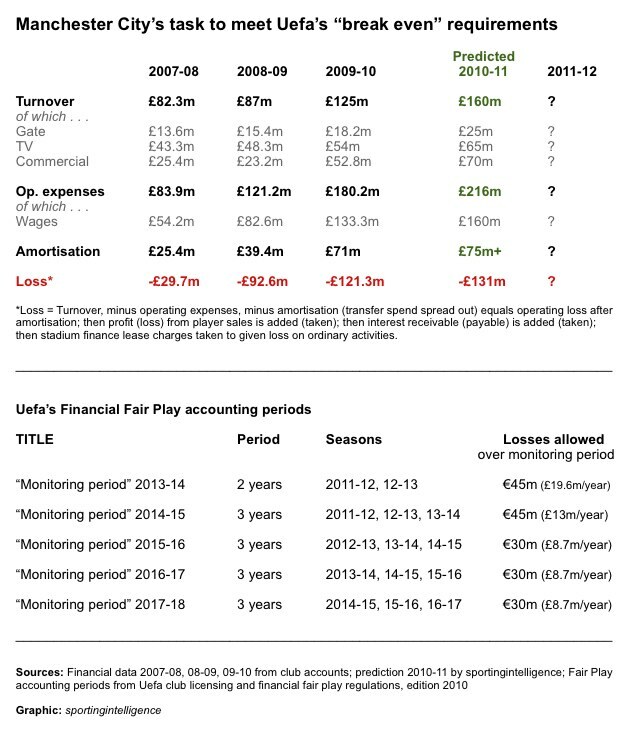 The FFP rules dictate that clubs must break effectively break even from 2011-12 onwards, when FFP monitoring begins. Two seasons of finances will be considered for entry into the Champions League or Europa League in the 2013-14 season. Initial losses averaging £19.6m per year will be allowed, but from 2012-13, losses will be capped at £13m per year (averaged over a three-year period), and from 2013-14, be capped at £8.7m per year. (See table below). The size of City’s task is illustrated by the fact they made a loss of £121.3m in 2009-10, and expect losses of £130m-plus in 2010-11. The trend is hugely problematic and the transfer “backlog” is a damaging part. Because City won’t be allowed to clear that in one go, the £250m will have to be amortised (spread out) over five years. In simple terms, City will start every season between now and 2014-15 with a red hole in the accounts averaging £50m per season – for players they already own – before a ball is kicked. If they sign anyone else from now on, the deficit will only get bigger. Amortisation of transfer spending is a necessary requirement under FFP regulations relating to British clubs. It makes no difference if City have actually already physically handed over all the money to the selling clubs for the players in. For accounting purposes, the fees need to be amortised over the length of the players’ contract. The £250m is an estimate calculated by The Independent from data within City’s 2009-10 financial accounts, released last week, and has been corroborated by sources with insight into City’s financial situation. City’s net spending on players on players including Wayne Bridge, Gareth Barry, Carlos Tevez and Yaya Toure among others since June 2008 has been £332.6m. (Nb: gross spending much higher). City hope to meet the FFP requirements by achieving giant leaps in income, especially from Middle East firms; by playing Champions League football for the next two years (a sizeable earner); and by producing its own young stars for the first team and for sale in the near future. But there are no guarantees of success – and other challenges on top. The biggest of those is a wage bill that grew to £133.3m in 2009-10, which alone was greater than City’s entire income of £125m. That wage bill is expected to rise to around £160m in 2010-11; again that bill is expected to be close to the club’s total income. In 2009-10, the club’s operating losses – income minus operating expenses, of which wages are the biggest single part – were £55.1m, and will rise. The operating loss plus the amortisation value leads to the overall loss (give or take a few other bits and pieces). City argue, with some justification, that owner Sheikh Mansour’s investment of hundreds of millions is rebuilding not just a club but a community, with spending on everything from facilities to improved pies, a better website and an academy aimed at nurturing home-grown players. (No other club can better City’s figure of fielding seven full England internationals in league games alone this season, albeit not all raised in Manchester). And if City exceed Uefa’s FFP limits solely because of spending before the rules were published this Spring, punishment may be reduced if not avoided. But even City insiders acknowledge they have actively chosen to keep on spending in 2010 – on players and wages – on the “if you don’t spend, you don’t grow” principle. As recently as last weekend, Uefa’s president Michel Platini, the driving force behind FPP, said in an interview with the Italian equivalent of the FT, Il Sole 24 Ore, that the FFP rules would be tightly monitored and enforced. That interview, in Italian, is linked here.